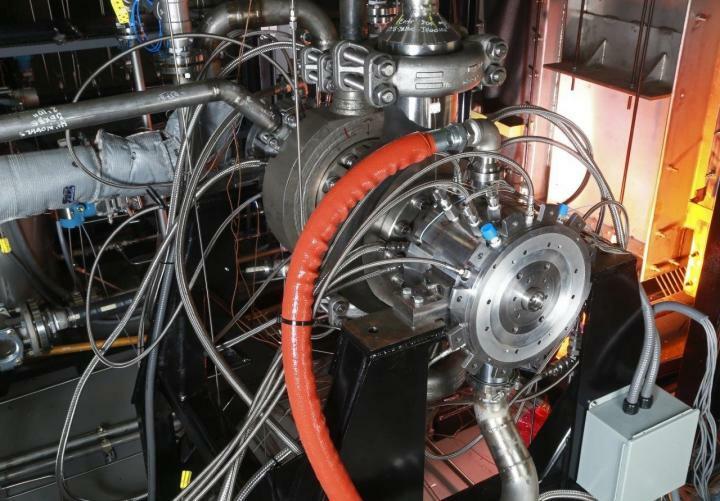 SAN ANTONIO — April 8, 2019 — A team of Southwest Research Institute and General Electric (GE) engineers have designed, built and tested the highest temperature supercritical carbon dioxide (sCO2) turbine in the world. The turbine was developed with $6.8 million of funding from the U.S. Department of Energy (DOE) Solar Energy Technologies Office (SETO), in addition to $3 million from commercial partners GE Research, Thar Energy, Electric Power Research Institute, Aramco Services Company and Navy Nuclear Laboratory. Additionally, the DOE’s Advanced Research Projects Agency – Energy (ARPA-E) Full-Spectrum Optimized Conversion and Utilization of Sunlight (FOCUS) program provided financial support and extended the test program to validate advanced thermal seals. “The full 10-megawatt turbine is the size of a desk and yields the highest power density of any industrial turbine, rivaled only by the turbopumps used on the space shuttle engines,” said Dr. Jeffrey Moore, a mechanical engineer at SwRI and the principal investigator of the project. “This will not only improve concentrated solar power plant efficiency but also improve the efficiency of fossil and nuclear power plants, as well as lower the cost of waste heat recovery and energy storage.” This small but powerful turbine can withstand the tough operating conditions of concentrated solar power (CSP) plants and is highly scalable, to as much as 450 MW. This technology could result in a two to four percent efficiency increase for fossil plants, reducing CO2 emissions equivalent to 14 million cars. For more information, visit https://www.swri.org/supercritical-transformational-electric-power-pilot-plant.